$28.82 Winco NPM-7 Stainless Steel Pasta Maker with Detachable Cutter 7"
An excellent addition to both home and commercial kitchens, the Weston 01-0601-W Roma Express Electric Pasta Machine cuts delicious strands of fresh, homemade pasta. Featuring 5-3/4" wide rollers, this pasta machine has 9 adjustable settings that allow you to efficiently make paper thin to 1/10" thick pasta. Designed with safety in mind, this electric pasta machine has a built-in safety switch that cuts power when the cover is opened. 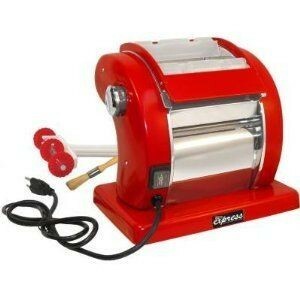 Thanks to its heavy duty construction and metal housing, this electric pasta machine will withstand years of use.